The International Campaign to Abolish Nuclear Weapons (ICAN) is an international coalition that brings together humanitarian, environmental, human rights, peace, and development organisations in nearly 100 countries, working with parliamentarians and governments to achieve a global treaty to prohibit nuclear weapons, leading to their total elimination. For more about this please see the international website. ICAN UK is a collaborative project hosted by founding partner organisation Medact, to support ICAN’s goals with information, analysis, advocacy, training and outreach. 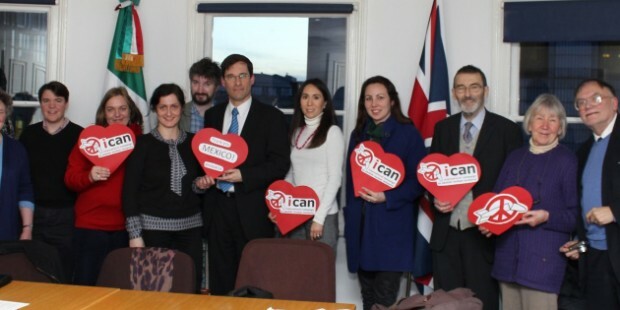 ICAN UK works closely with a range of Partner Organizations. Funding The work of the Co-ordinator is generously supported by Polden Puckham Charitable Foundation and Joseph Rowntree Charitable Trust. We are also grateful for support for our work from individual supporters. If you would like to make a financial contribution to ICAN UK, please do so via Medact’s JustGiving page here, specifying that the donation is for ICAN UK’s work.